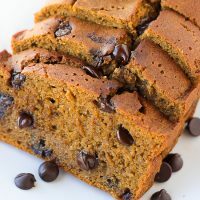 The Best Gluten-Free Pumpkin Chocolate Chip Bread! Incredibly flavorful and moist loaf that is perfect for Fall. You can substitute the flours in this recipe with 1 1/2 cups Erin’s Grain-Free Flour Blend. Bake for 45-50 minutes. Allow the bread to cool completely in the pan on a wire rack before slicing, at least 1 hour. Enjoy! To store the bread, once it is completely cool, wrap it tightly in 2 layers of plastic wrap and place in a ziploc bag. It will be good at room temperature for 2 days. Freeze individual slices for up to 1 month. *This recipe works best with blanched almond flour which has a finer consistency than almond meal. However, almond meal will work if that’s all you have on hand.